While it’s likely you’ve heard of an espresso café, or a café that serves breakfast and lunch, or other small bites, a death café may not be as familiar to you. Death cafes are not establishments where you go to get food or beverages; they are a type of gathering where people get together and talk about death. Death cafes began in 2011 in the United Kingdom, with a purpose of encouraging open discussions about death that might help us to live our lives to the fullest, while also coming to terms with its finite nature. Over the last several years, death cafes have become increasingly popular, and have spread throughout Europe and North America. At a death café, attendees come to talk about a variety of topics and issues related to death, such as hospice and palliative care, dealing with grief, end-of-life services, burial planning options, and other related topics. Anything death-related is on the table. There may also be some light refreshments provided, as a way of making people feel more comfortable and relaxed. At a death café, however, you can talk openly about this natural occurrence and refer to it using whatever term you prefer. Of course, you’re free to use the word “death” anywhere you’d like, and as often as you’d like, but at a death café, it is encouraged. These gatherings are meant to be a safe place to talk about what no one wants to (or thinks they can) talk about anywhere else. Attendees can be anyone interested in talking about death, no matter what their situation. 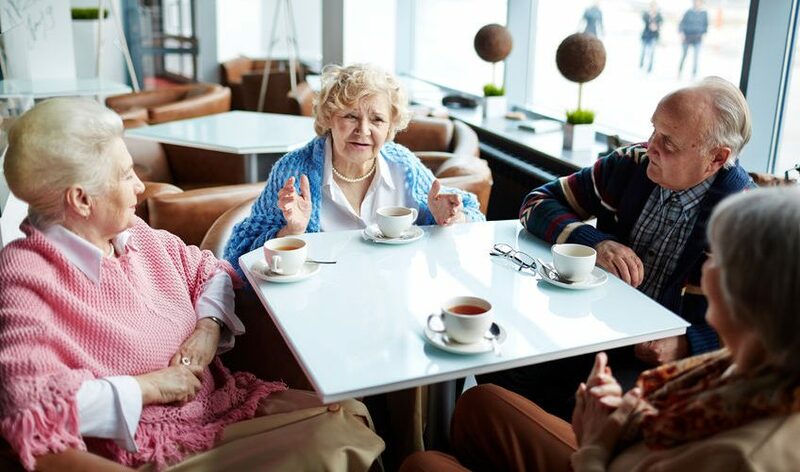 Whether you’ve just lost a loved one, you’re still grieving the loss of a loved one some time ago, or none of the above, a death café can be an educational and eye-opening experience for any human being – one that’s unlikely to be like any other gathering you’ve been to. You may wonder why one would want or need to talk about death with people other than their immediate family members, or at all. While no one is saying you have to talk about death, many have said it can very satisfying to talk openly and honestly about their feelings around death. By talking with people of all different ages, backgrounds and religious preferences, there are more opportunities to learn from other people’s experiences with death. In addition, your experiences and thoughts around death may provide important insights and comfort to others who may otherwise never have heard your story or perspective. Maybe you are looking for the right words to bring up a conversation about death with a loved one, and you may find someone at a death café who has been in that exact situation, who may be able to offer some advice. Maybe you don’t know how to talk about death with your children, and would like to talk with other parents about how they have handled it. Or, maybe your chosen profession requires an understanding of how to talk about death with dying patients and their loved ones, and you’d like to start practicing with others. Any of these, and many more, are great reasons to attend a death café. The Concord Regional VNA’s Hospice program staff hosts a “Dying to Talk” café every month. These gatherings are meant to provide a place where people can breathe life into conversations about death and dying. Discussions range from advance directives to grieving rituals and focus not on how we die but how we live. All cafes are held at True Brew Cafe in Gibson’s Bookstore, 45 South Main Street, Concord, NH. This month’s “Dying to Talk” café will be held on Wednesday, June 28, 2017 at 5:30 p.m., and the topic is: “The Variables in Do Everything.” Pre-registration is not required. For more information, call (603) 224-4093 or (800) 924-8620, ext. 5815. For Portsmouth area residents, there is also a death café scheduled at Portsmouth Public Library, 175 Parrot Ave., Portsmouth on Wednesday, June 28, 2017 from 6-9 p.m. The event is free and open to the public, though space is limited. For additional details, you may view the event on Facebook. RSVP to Hospice Help Foundation, at 603-766-0444 or janet@hhelpfoundation.org. For additional information burial planning services and options, contact us.